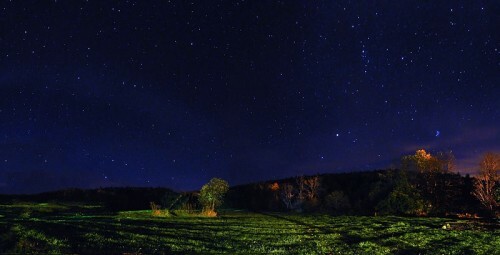 This constellation is the same as Orion, but can also be seen as this cross on a hill. It is best seen in mid-winter, traveling east to west through the night in mid-sky. Orion begins to appear in August, in the pre-dawn hours. However, Orion does not look like a Cross, until it stands upright, later in the season, in pre-dawn hours. Go out in the clear dark night and behold Orion in his four offices! Then show a friend! NOTE: The three stars at the top of the cross, are fainter than the other stars that make up this cross. So if you are in the city, you will have to look carefully to observe them. The Cross of Orion Constellation Wikipedia star-chart. Cross and hill sketched in by editor of this website. It seems obvious that the Orion Constellation fulfills the above verse. Orion seems to be the sign of the Son of Man in Heaven. But in a greater sense, all these signs on this website, are the signs spoken of in Luke 21:25… “And there shall be signs in the sun, and in the moon, and in the stars; and upon the earth distress of nations, with perplexity; the sea and the waves roaring;” Luke 21:25. So in a very real sense, they seem to be the “sign of the Son of Man in heaven.” And it is just now in history that God is revealing this wonderful truth. And these signs tell the glorious Gospel Story in an orderly year-long cycle, from start to finish, beginning in early spring. And though they tell the basic Gospel story, these signs also present an important message to those who wish to enter into glory with Christ. 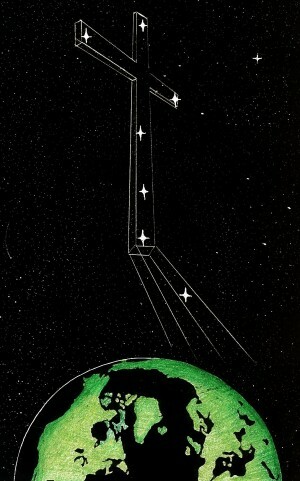 This optical illusion combination constellation, known as Orion, is an amazing declaration from our Creator/Redeemer. ‘Orion the Soldier’, ‘Orion the Reaper’, ‘Orion the Archer’, and last but certainly not least, ‘The Cross of Orion’. These are the four offices of Orion. Like an ensign lifted up, on a hill, is Orion. This prophecy not only speaks of God’s people as a sign on a hill. But Orion the Cross appears in the night-sky as an ensign on a hill, as this sketch shows. This glorious symbol of God’s great love, mercy, and peace has been gracing the heavens since the days of Creation. Studded with these “heavenly diamonds”, Orion has safely guided ship’s captains across uncharted waters down through the centuries past. Consequently, nomads, wandering through dry and thirsty sands, have found their bearings by looking up to Orion’s faithful nightly crossing of Heaven’s ‘black sea’. “But God forbid that I should glory, save in the Cross of our Lord Jesus Christ, by whom the world is crucified unto me, and I unto the world.” Galatians 6:14. The Cross is the symbol that God has chosen, to represent the concept of self-sacrificing love. It is the symbol of universality, as it points northward, southward, eastward, and westward. Paul, in the above verse, speaks of his own spiritual crucifixion from the love for this world. That Christ may dwell in your hearts by faith; that ye, being rooted and grounded in love, May be able to comprehend with all saints what is the BREADTH, AND LENGTH, AND DEPTH, AND HEIGHT; And to know the love of Christ, which passeth knowledge, that ye might be filled with all the fullness of God.” Ephesians 3:17-19. Do you see what the above verse says? It says that we might know the breadth, length, depth and height of God’s love. This is a theme worthy of much contemplation as we study God’s Word in the light of the Cross. This verse seems to be taking us into four different directions: that the Cross symbolizes God’s love which spans in every possible direction, including the depths of Hell, and the height of Heaven, and even goes beyond time and space. It is far more than mortal Man can comprehend! FORSAKING ALL TO FOLLOW HIM… “Let this mind be in you, which was also in Christ Jesus: Who…humbled himself, and became obedient unto death, even the death of the Cross. Wherefore God also hath highly exalted him…that every tongue should confess that Jesus Christ is Lord, to the glory of God the Father.” Philippians 2:5-11 (condensed). The Church of God…His elect…He has been chosen to follow Him. We are to take up our Cross and follow Jesus. We are like that “Rich Young Ruler” in Matthew 19:16 to whom Jesus lovingly bids… “Then Jesus beholding him loved him, and said unto him, ‘One thing thou lackest: go thy way, sell whatsoever thou hast, and give to the poor, and thou shalt have treasure in heaven: and come, TAKE UP THE CROSS, and follow Me. '” Luke 10:21, 22 . Here again, the Lord is greatly encouraging us to seek after heavenly treasure, and not after the earthly mammon. For 2,000 years, the Church has struggled to proclaim the Gospel to a lost world. Suffering persecution from the world, and from the worldly church, God’s elect have even struggled with our own earthly ambitions. Just like that Rich Young Ruler, we are hesitant to give all and follow Him. The Rich Young Ruler had just too many talents and attainments to give up for Christ. But not so for the Disciples. No, they were ready to forsake this world, with all its allurements, so that they could follow Jesus. Just listen… “And when they had brought their ships to land, they forsook all, and followed Him.” Luke 5:11. This verse speaks of Christ’s Disciples, who, upon receiving the call to follow Jesus, forsook all this world and followed Jesus. In essence, the forsaking of this world with all its seductive allurements, is akin to taking up the Cross. This is part of what it means to die to self and to selfishness. We have the great privilege of taking up our Cross and following our Lord. But we can’t follow Him while trying to drag along a hoard of earthly treasures… “And he that takes not his Cross, and follows after Me, is not worthy of Me. He that finds his life shall lose it: and he that loses his life for My sake shall find it.” Matthew 10:38, 39. When we receive the “New Heart”, we receive also a “Brand New Life”. No longer do we desire to go after the things of the world. We now long to be faithful followers of Jesus…just like John and James and Peter…and Paul. How few Christians have heeded this heavenly injunction. Especially in this era of vast material wealth. We are a world of super-consumers. We have “more than heart could wish” Psalms 73:7. But as the wise man said… “vanity of vanities…all is vanity…and vexation of spirit.”Ecclesiastes 1:1, 2. Truly we have become vexed in spirit. Truly it’s impossible to take up the Cross with our arms full of stuff… “So likewise, whosoever he be of you that forsaketh not all that he hath, he cannot be My disciple.” Luke 14:33. This prophecy of Isaiah is speaking of this very moment in history. The Devil has filled our society with all types of materialism, careers, amusements, and aspiration s. But now more than ever, God’s people must cast off these heavy burdens, and flee to the clefts of the ragged rocks of God’s Word and prayer unceasing. It’s time to lift up the Cross. Just like that constellation (seven stars), we must imitate our Lord. Just as this above Bible passage says, God’s people are to possess the mind of Christ. And likewise, as the Seven Stars Constellation (sketch on right) looks across the heavens at The Cross of Orion Constellation (sketch on left), we need to look up and lift up our heads above the din and mire of this world, and look up…unto the Author and Finisher of our faith. We must lay aside every weight that drags us down and holds us back. We have little time left. It is now high time to run that race. These two constellations are seen in this upright position during winter (starting in October, in pre-dawn hours). These are seen in mid-sky. The ‘7 Stars Constellation’ in the northern sky, and ‘Orion’ in the southern sky. It is easy to get the idea, from reading Paul’s writings, that running the Christian Race is comprised in filling up our day in handing out tracks, or witnessing to a great number of people, or managing some complicated ministry. And though there are some who seem to thrive on such feverish evangelistic endeavors, this is not necessarily what God was speaking about, when encouraging us to run the Christian Race. Maybe the Lord will inspire some do such an intense ministry; yet there is a far greater commission which God has given the Christian. See here that Paul’s great desire was to win Christ! Oh yes, Paul had a great desire to preach the Gospel. But more than this, Paul desired to become totally Christ-like! He knew he needed a much deeper experience. It was Paul’s goal to die a deeper death to self, that Paul might live a more Christ-like resurrected life. This was the race which Paul spoke of: a deeper, more abiding trust and faithfulness. A greater knowledge and wisdom of God’s Word. And so Paul sought after that knowledge, but also after the personal sufferings and experiences which would bring about that total death to self (see Colossians 1:24). And so he concluded by saying, “I press toward the mark for the prize of the high calling of God in Christ Jesus.” Philippians 3:8, 10, 11, 14. No, the Race which we are to run does not even require legs. It can be run from a prison cell or hospital bed. To become changed into the image of Christ is the Prize we will win. And those who choose to follow after Christ in this way, will find that the glory of Christ can fill a sad hospital room or a dark prison cell with the light and glory of God. And now, with so little time left, God is willing to give us all that He has, if only we are willing to give Him all we have. God has given us a wonderful example of what a Christian can become. And that example is the Apostle John. John was not the product of higher education. He was not trained in the school of the Pharisees, as was Paul. Being a lowly fisherman indicates that John probably had not read books on history, or philosophy, or theology or science. No, the secret to John’s success was his burning desire to imitate his Lord, Jesus, in every way. When as a follower of Jesus, for over three years, John seemed to always keep close by Jesus’ side. He stayed at the well of Sychar when all the others went to town. He leaned on Jesus breast, symbolizing this close relationship he had with Jesus. John just seemed to be always there. And no doubt, John continued to immerse himself in God’s Word, long after Jesus returned to Heaven, ever learning, and ever growing in grace and in the knowledge of his Lord and Friend, Jesus. And in this old painting of John, the artist seemed to really ‘get it’, concerning John’s desire to be Christ-like. This painting depicts John as very much like the typical paintings of Jesus. And so the great message written in the heavens, which God is now revealing to us, is a wonderful message. It is the message of the Cross of Christ. It is the Gospel of self-sacrificing love for a planet in rebellion. And it is an encouragement to those who have been called and chosen: an exhortation to cast off this present world and follow Jesus, as He leads us up a Pathway to a heavenly city: a city built on a foundation of selfless love for fallen humanity and a holy reverence for a wonderful God.